Camp Pendleton, Calif. — Imagine that a lithium ion battery is thrown away in the trash and taken to a landfill. It just happens to be summer time, and it is record hitting heat. The lithium ion battery that was improperly disposed of overheats and activates a chemical reaction within the battery that ignites it. This can be a very typical scenario, but with the right resources and education, easily avoidable. The Hazardous Material (HAZMAT) Waste Section, Environmental Security Department, Marine Corps Installations – West, Marine Corps Base Camp Pendleton, coordinates with units that train on Camp Pendleton to properly dispose of hazardous waste so scenarios like the one above do not happen. The waste section ensures everyone on base deals with hazardous materials properly and in accordance with federal and state regulations. In doing so, people, property and training do not suffer the consequences of improperly handling hazardous materials. 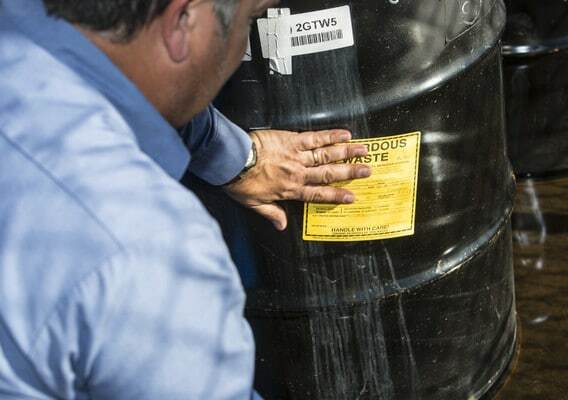 The HAZMAT section handles waste which includes: fuel, oil and antifreeze as well as lead acid, alkaline and lithium ion batteries. In 2018, the HAZMAT section was able to recycle over 2,500 gallons of antifreeze, saving over $40,000 in antifreeze consumable costs. To further demonstrate the effectiveness of the HAZMAT section’s recycling effort, its proper handling of lead-acid batteries generated a revenue of $50,000 which might have also cost over $54,000 in potential fees if improperly disposed. “We look for opportunities to reduce, reuse and recycle materials which saves units and the Marine Corps money,” said Osborn. Osborn said a misconception about properly disposing hazardous material is that it is an extra burden or chore, but in reality, ensuring proper management of these things saves money and the environment.